affordable health care options. To open up Vermonters to such risk as being uninsured is incomprehensible. It’s time to consider other revenue sources like taxing people with extremely high incomes. away from many Vermonters. Isn’t this a hidden tax increase on the middle class? The governor also proposed that teacher retirement be put in the education fund. Isn’t this also a hidden increase in property taxes? Won’t schools be accused of extravagant spending as they try to absorb these hidden tax increases? The whole idea of income sensitivity rebates was to equalize taxes across almost all income levels of the Vermont population. This gave everybody a stake in the funding system. It also provides equality for all towns and citizens. Does the governor’s proposals corrupt these democratic principles? Douglas is correct on Act 60 and Act 68. The Common Level of Appraisal mechanism is based on a deeply flawed statistical model. The CLA is a sleazy way for Montpelier to raise taxes for education without ever standing up and having a vote on it. This model has enabled the uncontrolled growth of education spending. Douglas is wrong – we need to back Shap Smith’s proposal with a gas tax increase. We need to earmark part of the gas tax for Local Aid of Roads. We need to have a sunset income tax surcharge on people above $75,000 (myself included). This is a time for shared sacrifice not just cuts. Here in Killington, our town has prided itself in our local school system. Before Act 60 and 68 it was affordable to live in this town. I can no longer afford to live here since my taxes have gone up several hundred percent since the inception of these acts. How can you tell me the repeal will not lower my taxes? Where does the idea of a state wide teachers’ contract and similar statewide health insurance benefits fit into the spending equation? As I’m sure Sen. Shumlin knows, salaries and benefits consume the lion’s share of school budgets and any control over budgets must include control over this item. I have not hear this issue addressed very often. In the interest of disclosure, I am a school board member here in Middlebury. 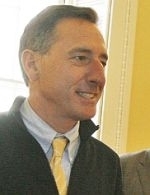 I would like to ask Sen.r Shumlin’s response to cutting the health care budget by getting rid of the new Catamount plan. Has he considered restructuring it to move Dr. Dynasaur kids into the premium assistance plan with their parents? This would increase the premiums paid by the state, but would lower the amount of Medicaid money paid out for children as Dr. D would then be the secondary payor. Given that some reported 80 percent of health care dollars are spent on avoidable illnesses caused by bad eating habits and lack of exercise, where are the state nutrition and recreation/exercise awareness programs? Listen to Governor Jim Douglas deliver his annual budget address to a joint session of the Vermont House and Senate.